The winter season is in full swing with many Snow-O events coming up, including the Ski-O in Morin Heights on February 17, a joint event with the Viking Ski Club. See our events page for many more out-of-town events. + 2019 membership form is now online: Renew or join the club! This year’s Mount Royal Classic saw a number of new faces beating the local heroes on their home mountain. Well over a dozen of runners fom Ottawa came over to compete in this 2nd of 5 “Quebec Cup” events. In the men’s long-advanced course, Irish national team runner (and new Montrealer!) Eoin McCullough won with a time of just over an hour, 3:52 ahead of Ramblers’ Francis Falaredeau. Third place (+5:33) went to young talent Robert Graham from Ottawa Orienteering, an impressive performance for a first-timer on the mountain. In the women’s long-advanced, the battle was between two runners from Ottawa, with Marketa Graham winning over Elisabeth Fink (+6.19). The short-advanced course was dominated by the performances of two other Irish runners, Elizabeth and Martin Jakobsson. They had actually only flown into Montreal for a wedding, were still hung-over and hence decided to “only” do the short-advanced. What else would you do on the only free day you have in Montreal, before you fly back home? No better way to get to know the mountain than go orieneering! The battle between the two spouses was on, with Martin admitting that his wife would usually beat him on flat ground. But Mount Royal proved to be too hilly! Martin Jakobsson won the men’s in 41:19, ahead of Rambler Ciprian Coman (+8:36). Martin’s wife Elizabeth Jakobsson won the women’s in 52:45, ahead of Janette Finderup from Ottawa Orienteering (1:20). We had an unexpectedly high turnout with 171 people, and 119 starts. The great weather surely helped. For the first time, we used the CEPSUM as start location, which put a new twist to all courses. All courses had more elevation than usual to cover. Thanks to all volunteers for their help! The 2018 Bois-de-Liesse event was run in bright sunshine in open forests with spring ephemeral flowers in profusion. It was a lovely day with an outstanding turnout to mark the first use of our new map. Four courses were set, Course 1 2.5 km; Course 2, 3.0 km, Course 3 4.5 km, and Course 4 6.2 km. The terrain was wet underfoot with some flooded paths after considerable recent rain. Overall we had 99 starts and 144 participants. 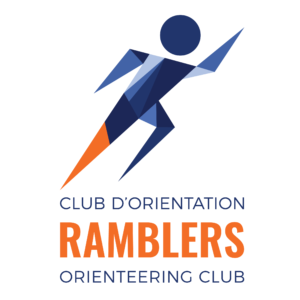 It was a great way to welcome the many new members to our club, as well as to mark the beginning of our forest orienteering season. I’d like to thank once again everyone who pitched in and helped make this day a success.